Remember those nails that people used to wear in the 90's, those really long nails that let you know you could be clawed to pieces at any moment? Well thank goodness 2000 introduced nails of a more manageable size. If you are a busy lady on the go and you just can't get to the salon, well Revlon has you covered with their new nail collection. The picture above features the "sequins" nails which include a little glittery detail towards the top of each medium length nail. You also receive in the package a little glue to keep those nails in place. 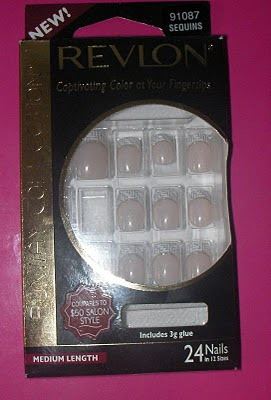 Revlon was kind enough to pass these nails on to me - thanks Revlon, and I passed them on to a reader and fellow blogger who kindly tested this product, thanks Mrs. Young Fashions. She was all set for an evening of fun in NYC, so she prepared by snapping these snazzy nails in place. Although she hadn't worn fake nails in quite some time, she quickly got into the grove again as she effortlessly applied these dazzling nails. 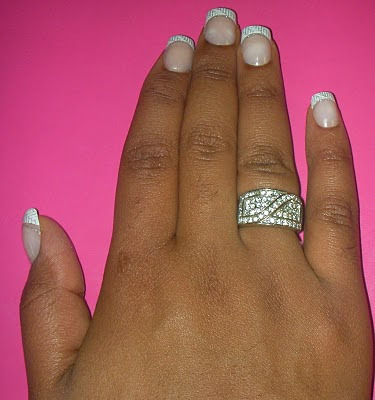 She really liked the look of the nails and the fact that they are a manageable length. She also notes that she took them off prematurely because she hadn't completely reacclimated herself to the world of fake nails. However, she notes that, that was "some strong glue" lol. I think the nails look great on her hands, what do you think? According to the text on the packaging, this designer nail kit is comparable to a $50.00 manicure. However, you can make your purchase at a drugstore near you for roughly $8.50. Do you wear false nails or did that die out in the 80's / 90's? I would like to thank you all for still checking out my blog for 2009. I really appreciate all of you and each comment that you leave on this site (or youtube) :-). You could read a million other blogs, and lets face it you probably do..lol but thanks for stopping here too. I hope to make this blog much better in 2010 (that probably wont happen until around July..lol just being realistic). Now before the tears drop let me get down to business. I may pump out a few more reviews today so stay tuned. We have come to the end of another beautiful year, so of course I had to present you with my 2009 IT LIST. This list will feature all of the great items that I will surely carry into 2010. Much of my 2008 list is still in play too, but here are my 2009 favorites! Brown Butter Beauty Moisture Milk Spritz and the Darcys Botcanicals herbal Leave in sprtiz- both shown in this video. Natural soap company- chagrin Valley- specifically the cucumber yogurt soap. Natural Deodorant- by OYIN LOVE THIS STUFF. please see the review below. This video features an antioxidant rich cream by Ojon and a 2 in 1 product from Tarte. The Tawaka product must be thrown into my SKIP IT FILES. Despite the natural antioxidant filled ingredient list, this product fails to deliver moisturized skin. The ever so annoying two in one lip product from Tarte is also on whomp whomp status, a purchase I will never make again. This is part two of my Black Friday haul video. I had to split this video into three parts because, well, I talk too much..lol. In the videos I show my two hauls from Tarte and Chagrin Valley. I'm almost embarrassed to ask this in public but ummmmmmm have you seen the reality show Jersey Shore? If so what are your thoughts? Although MTV blocked out the punch that rocked Snookie, if you saw the preview last week you already saw the PUNCH. I like in NYC and it was already reported on the radio that the guy who punched snookie is actually a teacher from Queens NY, he has been suspended. That show makes me vomit in my mouth a little more each time I see it, yet I can't turn away. Snookie's idea of "rocking the dance floor" involved a series of cartwheels in her DRESS as she exposed her undergarments in a crowded club. Now would her roomates look on in disgust, or attempt to drag her off the dance floor? NO, in fact Jwow said "I'm so proud of her" HUH????? Ok I just can't and people were upset with Tiny and Toya? Please, Tiny and Toya actually did things like open a business (or at least she attempted to start one), write a book and take care of their kids. These people from the shore basically do nothing but drink and fight....yet I'm all tuned in for the shenanigans. Will you see Avatar this weekend? This movie features some real talent in addition to the fact that this type of "animation" has never been done before. They actually built special cameras just to film this movie. All of the characters had to wear sensors on their bodies as they filmed to allow the computers to capture their movements. I just wanted to create a video on the Love Lettuce exfoliating mask from Lush. If you can't watch the video, it's a pretty good mask with some nice ingredients. Did you happen to catch the Jackson Family reality show which aired last night? If you saw the brothers...especially that Jermaine..lol what are your thoughts? I hope you all have a fabulous Monday. The video below is just the part 1 haul video for my Black Friday purchases. Since I didn't receive everything yet I will make another video later. So what did you get on Black Friday, anything interesting? When I first saw this 15 piece Tarte lip gloss set priced at a mere $39.00 I knew I was about to make a purchase. This lip set it packaged in three separate boxes Dazzling Divas: which features all of your shimmery glosses shown on the top row in the picture below. The second row of 5 glosses is from the Twinkling Trendsetters box followed by Glittering Green Goddesses. paraben free, petro-chemical free, pthalates, sulfates, gluten, tricolsan, preservatives, talc, synthetic fragrance, MEA/DEA/TEA, glycol, formaldehyde, GMO free oh yeah and it's curelty free too! It does include pomegranate, acai and goji berrry exacts. The glosses are not tacky so you don't have to worry about your lips sticking together. I made my purchase from Sephora but you can order this item directly from Tarte. Today I posted a video on my new favorite facial wipes, the Pomegranate Korres wipes. I also speak briefly about the Darcy's Botanicals Moisture Whip product . Finally I share one way in which I like to get my dose of antioxidants. Yes, it's cyber Monday the next big shopping day after Black Friday. Are you still standing? Did you buy yourself out of house and home? Did Black Friday put you in the RED? After a while, those discounted prices start to add up..lol. I made purchases from various sites online, I did not leave my home on Black Friday. I can't lie I plan on peeking at some online stores Cyber Monday but hopefully all I will do is peek. 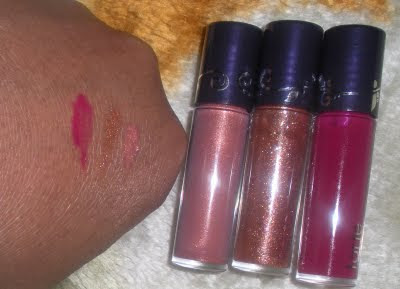 Tarte -40% off use the code CyberMon9 they have a nice lip gloss set which I will review soon. GNC- 35% off and free shipping with GNC gold card. Drugstore.com - Free shipping on any purchases over $25, they also have many cyber Monday sales. Check the Black Friday post because some of the sales are still going on. If you know of any sales please add the info to the comment section.- thanks! I tried uploading a video today but Youtube isn't cooperating...sorry. I have to say that I watched the Soul Train awards last night and I was not as disappointed as I thought I would be. As you may recall, in years past the once SOULFUL ode to soul music took a turn for the worse. I guess the celebrities were equally annoyed with the award show because they just sopped attending the show. So now someone else (BET) is trying to breathe life back into the Soul Train awards show. I enjoyed Terrance and Taraji as hosts even though all of their skits were CORNY. Chrisette Michelle didn't disappoint and neither did Fanny mae (Fantasia) as she sang her heart out to Chaka Khan. Johnny Gill can always rock the house. Lisa Wu from Housewives of Atlanta clearly went for the Elvira look so she was a complete #fashion FAIL draped in leather. I was happy that the show was not filled with performances of men with sagging pants and platinum filled mouths saying "yo shorty" a million times. The show wasn't great but it was less of a torture session than it had been when it was last televised. OH and what in the world was Deborah Lee wearing? Im going to need her stylist to be fired pronto. 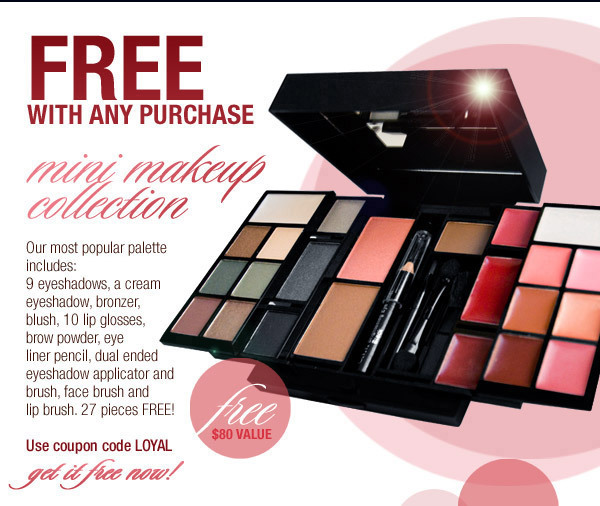 This is huge- get this 27 piece makeup kit for FREE from ELF with any purchase. Use the code LOYAL at checkout. I purchased one nail polish for $1.00 and got the kit for free. Get it while supplies last. HURRRRRRRRRY. Scroll down for my updates on Black Friday sales. Updated with Komaza details , Zoya info , Oyin, Ann Taylor, Miss Jessies, ElF, Carols Daughter , GNC , The Body Shop, Sephora , Newport News, Rosalyn Scents, sheScentit, OCC and Aerosoles. Karen's Body Beautiful-Use the code "THANKS" at check out to get 10% off of your order and there is NO minimum purchase. This sale ends Thursday Nov. 26th. Zoya This next one just made me SO happy because I love Zoya polishes. On what they call, GREEN Friday, not BLACK friday..lol you can get 6 FREE nail polishes if you make a $20 purchase. Since their polishes cost roughly $7 bucks that's not bad at ALLLLL. You basically buy 4 bottles and get 6 for free. Nov. 27th ONLY Unfortuantely this is only for the green colors and ZOYA selects the green shades. The code is "GREENFRIDAY " BOOOOOOOO. Hairveda- Black Friday and Cyber Monday sale. they have a new shampoo bar I am dying to try. Komaza- Use the code "Thanksgiving" for 15% discount Nov 26th- 29th. Miss Jessies- Nov. 27th- Dec 31st at midnight Buy one get the second one for free. The products must be equal or lesser value. ELF -starting now 75% off cosmetic cases and elements (I don't exactly know what they mean by elements) use the code EH75CE This is not necessarily a holiday sale but it's a sale nonetheless. Carol's Daughter- For every 30$ spent you earn $5 in Carol's Daughter dollars. IN STORES ONLY Nov. 27th. The BoDy Shop- Black Friday 3 items $30 in STORE ONLY, BUT there is also an online sale $2 flat rate shipping and buy 1 get one free. Brown Butter Beauty - Christine Grant on etsy -25% off sale starts Nov. 27th at 6AM. The sales price will be shown on the site. Rosalyns Scents is having a blow out sale. Shescentit- 25% off use the code "thanks25"
OCC obsessive compulsive cosmetics 10% off if you use the code "TOFURKEY" If you spend $50 or more you get free shipping. Dooney and Bourke- Friday Nov. 27th - Sunday 20% off your entire purchase at OUTLET stores. New York and company -online 50% OFF EVERYTHING. JJill - They have sales running now but last year they had a great black friday sale. Target- appliances, electronics etc. I heard about a $3.00 toaster so enjoy. GNC TODAY ONLY NOV . 26th 25% off and FREE Shipping use the code "GiveThanks1"
Don't forget to use retailmenot.com to find additional coupons. Please list any of the online sales that you know about. I have a review of the Oyin Whipped Pudding below. Time stops for NO ONE, not even for a woman looking for love. Remember Neenah, the woman who was hoping to find her future husband in 52 weeks? As you all know the month of November is almost over and Neenah is still as single as they come. She has even tried her hand at speed dating, she liked two of the guys but they didn't select her. If you care to check out Neenah's videos click here. I have a feeling she will need another 52 weeks to find a suitable mate. Any thoughts? Is anyone out there watching I want to work for Diddy, the reality show about working for Puffy? I actually like Poprah this season, while Ivory is a big no no in my mind. It's fine to have an opinion and even to have wonderful leadership skills, but some people seem to equate screaming and throwing their hands in someones face as an indication that they are strong and fit to lead a team. I beg to differ, such actions will certainly get you kicked out of any reputable boardroom. Unless of course you plan on working with Sheree's event planner.....Who Gone Check me Boo? Sales, Random Chatter and Yes or No? In the video below you are reminded of some Black Friday sales. If you know of any great Black Friday deals please post a comment. I also do a little random hair chatter and I reviewed the Yes to Carrots body scrub. Yu Be, a popular Japanese company, produced this minty lip balm with natural ingredients. For $5.00 you will get a non sticky lip balm that includes ingredients like rosemary, vitamin E, aloe vera, shea butter and other naturally good for you ingredients. However, please keep in mind that camphor is also on the list of ingredients so if you are pregnant this isn't the product for you. I was not disappointed at all with this lip balm, in fact I found it worked very well as a base before applying my lip tars. It also helped to keep my lips moisturized. If you have ever tried the mentholated lip balm by Burts Bees, then you will have a pretty good idea of what this product feels like. In fact I think the Burts Bees balm has more of a minty feeling which will make your lips tingle even more than the Yu Be lip therapy balm. Ingredients: Pure Olive Oil , Vegetable Castille Base, Fresh Lemon Infusion ,Toothed Wrack Seaweed Infusion , Fresh Lime Juice ,Coconut Oil , Neroli Oil, Mandarin Oil, Vanilla Absolute, Orris Absolute. How awesome is that, right???? Brown Butter Beauty provided me with a sample of their Lavender Red Clover natural soap when I made my last purchase. I love that this soap has pieces of lavender, leaves, and other eye catching plant life which give the soap some texture-- and its just cute to look at too! The soap is described as a moisturizing bar and I would have to say that my skin was not feeling dry after using it. I really need to purchase the full size, $7.00 bar in order to put the moisturizing claims to the test. 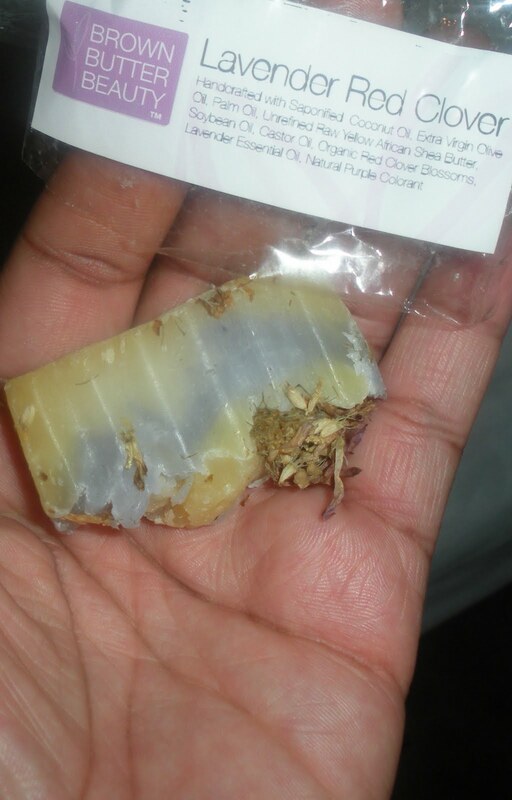 Here is the BBB explaination for including lavender in this soap "Lavender Medical Properties: Antiseptic, antifungal, analgesic, antitumoral, anticonvulsant, vasodilating, relaxant, anti-inflammatory, combats excess sebum on skin." This week Monique (yes I watched the show- don't judge me..lol) interviewed Beverly Johnson, her daughter and another model. During one point in the show Monique took a moment to acknowledge the beauty in all of the different shades represented by the 4 women on stage. There is so much beauty in all people of all backgrounds but unfortunately some people fail to see the beauty that they possess. I watched a video from the online Clutch Magazine site on racial globalization. Essentially, you have non European people getting various procedures to have a look that they feel is more acceptable in society.Check out this disturbing yet interesting video here. What do you think of people who get plastic surgery to move away from more ethnic features? Do you think the standards of beauty have changed much over the years? Do you ever find yourself using the European standard of beauty to measure your own looks or the looks of others around you? At the end of the video I mention that I don't recall the name of the first scent I purchased, but now I have total recall..lol. I purchased pina colada originally and it smells just like a pina colada drink without the alcohol. It is fruity without the sugary sweet scent. I like all of the scents I have tried. I've missed you all. I think I'm going to have a double post tomorrow :-). We've all seen them before, towelettes that promise to remove makeup while refreshing your face. I don't know about you but I am usually left with parched skin and mascara residue on my face, until now. 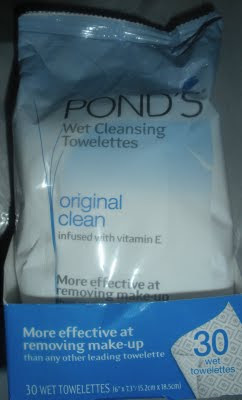 I tried the Ponds Wet Cleansing Towelettes which is infused with chamomile, vitamin E and a special triple tea antioxidant formula. The towel itself was very gentle, no abrasive areas at all so that was a pleasant surprise for my sensitive skin. Despite the gentleness of this product, it can remove waterproof makeup. This hypoallergenic 30 count towelette pack does not leave your skin feeling dry. Many of these towelettes on the market claim that you can take the towelettes on the go and use them throughout the day to refresh your skin, but that won't work if after every use your skin looks dried out and dull. Surprisingly, these cloths left my skin moisturized as it remove makeup and excess oil. The tip widget on the right side of your screen presented a special tip that can be used with the Ponds towelettes so I was enthusiastic to try it out. The tip suggested leaving the towelettes in the refrigerator and using it after a long stressful day. After a long day I turned to my trusty chilled cloths and viola that cool sensation really did make a nice addition to the already effective cloths. 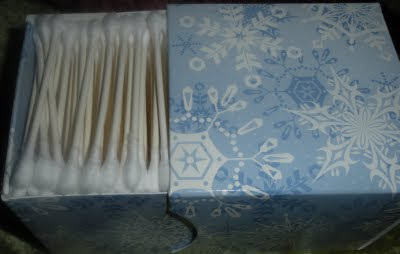 I also have to show you the cute limited edition seasonal vanity case that the Qtip company has released. Instead of the traditional q-tip packaging, this seemingly small case holds over 200 q-tips. Q-tip is my all time favorite brand of Q-tips, even when I have a knock off brand I still refer to them as q-tips- marketing at it's best..lol. No other company really compares to the sturdy q-tip base surrounded by soft cotton on both ends. The q-tip tip of the day suggested using q-tips to fix up minor makeup issues , which I think we all have from time to time. 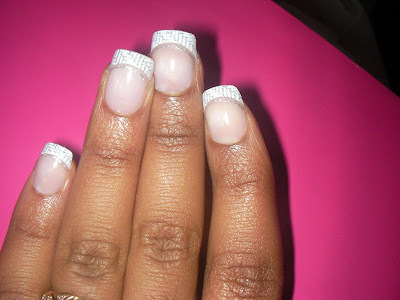 I have also used q-tips to remove excess nail polish from my hands and cuticles to reveal the perfect manicure. You can find both of these products at your local drugstore. Do you have any beauty tips? Many of us use mascara to make our lashes appear thicker and longer, but what if our desired length is never attained through those magical tubes with perfectly angled wands? What if perfect lashes continue to elude us as we go through countless tubes of mascara? Should some of us face the reality that may mascara isn't enough for the look we want to attain? Perhaps we simply want to have fun and switch from our usual look to lashes we could only fantasize about? Sometimes you just have to fake it until you make it! Let's take a journey through the world of fake lashes. Come with me on my first ever false lash experience. 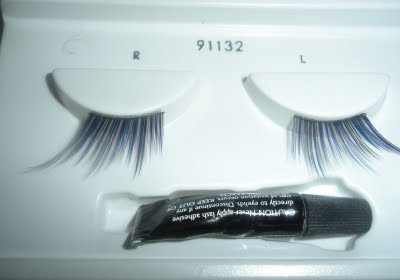 Below is a picture of the New Fantasy Lengths false lashes by Revlon in the color blue. It's almost like it has varying shades of blue and surprisingly it blended in quite well with my lashes as you will see. First I applied my mascara to prevent my lashes from sticking straight out while the falsies curved in a different direction. Next I opened my kit and faced my false lash fears.The kit is complete with a pair of labeled lashes (right eye and left eye labels as shown in the picture) and the oh so necessary adhesive. The lashes felt sticky on it's own but the adhesive allowed me to wear my lashes from dusk till dawn. Sure I went through all the common fears, will they blow off? Will I be left with one lash in place while the other one flutters down the busy NYC streets? I was nervous, but I didn't need to be because this adhesive was not allowing the lashes to budge. Here are my naked lashes. Then I applied a little bit of the glue to the line of the fake lashes and applied it to my lash line. A little bit of the glue was showing on my right eye (the eye on the left of your screen)but I simply covered it with black eye liner as you can see from the eye on the right side of your screen. As you can see I added a little eye liner to my eyes and I was ready to start my day with this winged/feathered Fantasy Lengths look. When I saw my sister later in the evening, she actually liked the look. My makeup hating sister loved the look..lol so that spoke volumes to me. Each week for the next 3-4 weeks I will showcase a different look from the New Revlon Fantasy Lengths line. Although I am still getting my feet wet in the false lash department this is an easy way to spruce up your look. You can purchase this product from your local drugstore for roughly $6.50. Do you wear false lashes? If so, which brand do you prefer? Is there any specific technique that should be followed when applying falsies? Do you reuse your lashes? If so, how many times do you wear a pair of lashes? Have you ever had trouble finding the best chocolate or wine colored lipstick? Well my search is now over because I have found lip tars. Check out the video to learn more about these $12.50 peppermint infused lip products. Please excuse all of my ashy skin!!! This picture is of a color named fondue. The picture is of a color named vintage. Sorry, this post is not about preparing your hair for the winter months, nor is it a post about financial preparedness. This post is about planning for things that will happen at a much later date. Now I am not one who talks about marriage or weddings all day long even though I think it's a great topic but once I saw the work of this photographer I was blown away. I looked at one wedding in particular but then I took a look at the work on her website and I fell in love. I love her shots outside as well as the way she captures the beauty of the bride and groom, (truth be told she has even done this for couples that are not making the top ten cutest couples list). Oh I also think I nailed down my wedding reception hall even though I am told they charge over $100 per plate and I have quite a few people to invite........Click on the word gallery to see pics of the building. So how far in advance do you begin your planning process? I'm leaving tomorrow for business and I will be gone straight through the weekend. I will pump out a post tonight and post it tomorrow. In this post we have two videos showcasing product twins. The term product twins, basically refers to two or more products from the same company that give you similar results. Further, the ingredients list may even be very similar however the products come in different jars, with different price tags.....lol. Check the videos for more info. In this video you will see a mini review of the 100% pure lip butter. I had already reviewed it on the site but someone wanted to see the actual application. I also reviewed the peppermint clarifying shampoo by My Honey Child. If you want to remove product buildup then check out that natural shampoo. Keep in mind that your scalp will TINGLE and your locks will feel a little dry so you need to follow up with a great moisturizing conditioner. Sooooooooo did you watch the housewives reunion part 1? Kandi just broke my heart, when she began talking about AJ, but aside from that I noticed a few things. 1) Did you notice how NENE calmed down? She wasn't loud and obnoxious- yeah I think she knows that she irked people this season and since her book is coming out she is going to need someone to buy it. If she gets on the nerves of everyone, then that equals NO SALES. In my opinion she is still the same obnoxious tv hog but she realizes that her behavior may interfere with making money. DID THE BANK FORECLOSE ON YOUR HOME? Lisa- So Ed and I knew that we wanted to downsize- DID THE BANK FORECLOSE ON YOUR HOME? Lisa- Well it was an arrangement (arrangement is code for FORECLOSURE) where we made a deal and left early and transitioned to our other home. She seriously said some nonsense like that...anyway FORECLOSURE. 3)Sheree- it would have been nice if she had worn something from She by Sheree, dang even Lisa understands promoting her own line. Not to say that she must be in She by Sheree at all times but at least for a big event like the reunion show. 4)Kim Kim Kim, poor delusional Kim. No ma'am she did not break up with poppa especially not if he shows up on set and they kissed. It doesn't matter if this pic was taken from her HS graduation or JHS because that hairstyle was NOT popular at either time period. She is rocking some Madonna hair in this pic which to me is an indication that someone got their dates wrong. Unless she was a youngster who moved to the beat of her own drum and she decided to rock a style decades after it's expiration date. Oh and I don't but the Nene/ Kim reconciliation. I can't wait for part 2 of the reunion where Kim will attempt to belt out some tunes over a digitized version of her voice. In this video you will see my review of a skin polish from Yu-Be, a Japanese based company who is making their mark in the beauty industry. Yu-Be produces products that are more on the healthy side, no parabens, synthetic dyes etc. In the video I reviewed the Yu-Be skin polish which can be used on your body and your face. I also reviewed the Chox soap from Lush and a free bubble bar that I received from Lush. If you are unable to watch the video, I will say that the Yu-Be product works well for my face and hands but it's not abrasive enough for my body. The chox soap is described so well on the Lush site that I went out and purchased it, but in reality it fell short of my expectations. The bubble bar is $8.89 and I would never buy it, good thing I got it for free so I didn't waste any money. Do not watch youtube videos with my credit card in close range..lol. Last night I ended up buying some lip tars and ummmm other stuff..lol. I think I need to put myself on product probation again..sigh. On the bright side, I will get those reviews to you asap. What do you think of the whole Spike Lee vs.Tyler Perry comments? If you haven't heard, Mr. Lee described Tyler's work as buffoonery and said Tyler's work was a throwback to Amos and Andy. Tyler recanted by stating that he uses characters like Madea and others as a way of opening up a discussion about, important topics like faith, respect etc. I think Perry and Tyler are two totally different directors and both have their own vision of how they would like to tell a story. While the Madea and Brown characters don't exactly make me laugh I can see past them and look at the point behind Mr. Perry's films. If Mr. Lee is on a campaign against buffoons then he should check out what's going on in some music videos before bashing someone who is actually attempting to send an important message. Part 1 of the Housewives of Atlanta show will air tonight, will you be watching? I will be glued to my set as the shenanigans begin. I can already tell from the preview that there will be some somber moments as Kandi talks about Aj. Nene is a doofus so I can't wait to see how she defends her behavior. Doesn't Raven Symone looks stunning, I love the dress but the shoes can exit stage left. I need that dress in my life!!!! I don't know about you, but when someone utters the words "beauty tip" my ears just perk up! I hope you noticed the wonderful beauty tip widget on the right side on the page, NO? Then take a look, go ahead I'll wait...(*taps fingers on table) lol. Each day a new beauty tip will be featured on the widget and I will be testing out the tips. Eventually I will present you all with a post on my favorite beauty tips from the widget. If you try out any of the tips, please let me know what you think. You can click the text "beauty tip of the day" and scroll through the different tip! The tips come from some popular beauty brands and you probably have many of the items in your home, so give the tips a try. P.S. I will feature a new product review tomorrow. In this video I am responding to some of your comments and questions. I think I will have to do another video to address other comments/ questions. 1)How to get thicker hair. 3)How long does my soap last? **Correction on the price of a product. I enjoy poetry so let me share with you one of my favorites by Daniel Beaty. Even though the subject of his poem doesn't relate to me persoanlly, how can you not be moved by this poem? Love it. If you know of any great poets please post their names for me...thanks. Today it's all about the body. I have a review of the new Dove Deep Moisture Body wash so check the video to see if it is worth the $8.99 price tag. 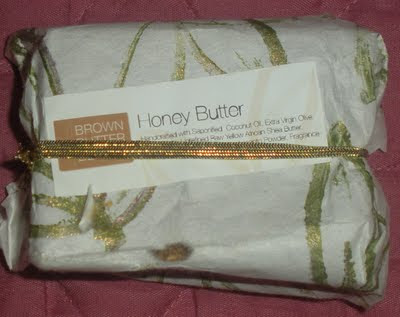 And because you are all so special, I have another review on the Honey Butter Soap Bar that I purchased from Brown Butter Beauty. I have to say that I purchased this soap because it has honey in it, all of the ingredients are natural and I thought the little honeycomb look was too cute. The good news is that this soap lathers really well and it lasts a good long time. I was really pleased with this soap overall. It was only $7.00 and it's the size of a bar of Dove soap (actually I think it's a little bigger than Dove). I still had to use lotion after using the soap but it didn't dry my skin out like some other soaps so I was happy. The packaging is cute, it comes in a little wrapping paper with a golden elastic band around the bar, perfect for gift giving. In terms of the way it makes my skin feel, I would purchase this soap again instead of the deShawn Marie soap because it beats DeShawn when it comes to moisture in my opinion. However it does not beat the cucumber soap from Chagrin, nor does it beat my good ol Porridge soap from Lush. Here is the list of ingredients: Handcrafted with Saponified Coconut Oil, Extra Virgin Olive Oil, Palm Oil, Unrefined Raw Yellow African Shea Butter, Soybean Oil, Castor Oil, Honey, Annanto Powder, Fragrance. Who do you watch on Youtube? Please let me know some of the channels that you frequent because I am always entertained by the different personalities on youtube. Do you watch TaceMa? 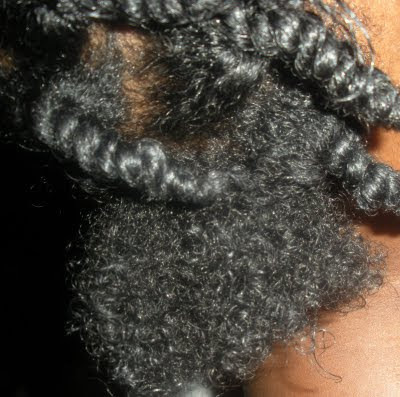 If you have been watching her for a while you may have witnessed her transition to natural hair. She has gorgeous hair by the way.... Anyway over time I lost track of her channel and then when I finally found it again, she was living in NY. Anyway I love her videos and I think the reason why I am drawn to certain blogs and youtube channels is because I see some of myself in the individual or at least the person seems like someone I could have a good time with. Would you change anything about yourself if you could? Do you think that change could have a big impact on your life? Now what about you? Yes you, you reading this blog, there are so many blogs out there so why read this one? Do you think that birds of a feather idea floats here in blog land as well? I honestly think that off line I would really get along with so many of you, even though hanging with some of you would get me cut..lol. Kandi's mom is protective and I love it...go mom. Kim- oh dear she has issues if she is really spending $12,000 each month on her HAIR. I'm not exactly sure how I will integrate this segment into my blog but I like to try many different things with my sister's hair so I may start including some of that on the site. First up is a pic of her natural texture, and in the second shot you see what her hair looks like after I applied the Darcy's Botanicals leave in conditioner. Yes I get it you are paying a lot for tuition and you should be able to wear what you want...however college is also a place that will hopefully prepare you for the real world and grooming is a part of that. I know in college there were some guys whose pants I wanted to yank up but going out for a job interview, they certainly knew what to do......So what do you all think about this rule, should Morehouse just focus on education or is Morehouse within it's rights to lay down the dress code law? I know I have been remiss in my blogging duties, but you still love me right? OK maybe not... and I will do my best to get another post up tomorrow. Trust me when I say that work has been very busy along with my other obligations, ughhhh life..lol. I will also respond to all of your comments asap. I should have a video answering your questions posted very soon, possibly tomorrow. Today please look at my review of the Brown Butter Beauty Hibiscus Nectar shampoo and the Sweet Milk Detangling Leave in Conditioner. For those of you who can't watch the videos, I love both of these products which happen to be reasonably priced at $12.50 each. I happen to really enjoy John Mayer songs but I had not heard the song "Gravity" until I listened to one of Youtube's superstars J'sun. Now I can't stop playing this song..lol Check out J'sun's rendition. My review of the new Molasses Hydrating deep Conditioner by My Honey Child. Of course it is a paraben free product. I have received many emails from so many of you, if I haven't reponded yet I certainly will. Check for the answers to your questions throughout this week and next weeks posts. Here is my review of the Brown Butter Beauty Babassu oil deep conditioner. This is a paraben free product. Do you use babassu oil? Today I am going to kick things off with a review of two "natural" masks from Lush. Remember to always check that ingredients list because you may find some surprises. Talc powder is included in one of the masks and it's not the best thing for our skin....check out the review for more info. So much money, time, and effort goes into making a film, so I would assume that all those involved would want to produce the best product. This has caused me to say - "what in the world were they thinking" when I first watched the trailer for Mama I want to sing. My sister saw the play when she was a kid and I always remember her talking about the young lady who played the lead roll, she described the singer as powerful! So why I ask you was Ciara given the lead role? Perhaps no other singers showed up for the audition. What makes matters worse is that the young girl playing the younger version of Ciara can Sing, so I guess her vocal ability will diminish over time????..... I won't even address the fact that the young Ciara looks nothing at all like big Ciara- #whoapprovedthis ? When I think of Love and Basketball young Kyla Pratt was a great younger version of Sanna Lathan, but I guess the brains behind Mama I want to sing could care less. I do like that Lynn Whitfield is in the film though. If you want to check the trailer, click here. On Friday I was supposed to see Fame but my plans switched to Saturday. After going to Dave and Busters we headed to the theater, but the next Fame viewing was so late that as a group we decided to see Surrogate starring Bruce Willis. I had not even heard of this film (remember I haven't watched tv in a while) but everyone else seemed excited so I was happy too! That movie was a disaster, it was slow, predictable and boring. During the film I wished for a surrogate who could watch the film for me! The on screen appearance of Boris Kudjoe did little to light a flame under this dry film. I won't ruin it for anyone who plans on seeing the flick but let me end by saying if you have seen Irobot starring Will Smith then there is no need to check this out. The crux of both films is basically don't let technology take over your lives etc. However, Surrogate sends that message through a low budget production. Side note- Boris' acting skills will at times make me want to ask him to exit stage left. I think it's something about about the way he speaks, but he's cute so I'm not complaining too much. What's on your minds people? I want to hear from YOU!!!! I hope your Monday is off to a fabulous start. Let's all have a positive outlook on the week despite whatever obstacles we may face. Ok that's my pep talk for the day..lol. The video below is just showcasing my most recent hauls from Brown Butter Beauty and My Honey Child. From MHC I purchased some items I have not used before so if you have used them, please let me know what you think. Sidenote- This has nothing to do with beauty products and such, but what are your thoughts on Keri Hilson? Like her love her or can you do without her? Whitney Houston- in her Oprah interview Oprah asked her if she was scared that she had lost the VOICE. I am paraphrasing but Whitney's response was something like this- "No because during that time period I was still singing to myself so I knew it was not lost"
I had to give Whitney the side eye on that one because her voice is not the same in my opinion. So while her voice isn't totally gone, it sure isn't what it used to be. I once saw THE VOICE live and her voice filled the theater....the good ol days...sigh. Housewives of ATL......Nene really grinds my gears this season and I'm mad that she has stolen this wig Kim with a married man.....no surprises here. Hello -I'm back with a video which features a miss Jessies product review. Yes, there is absolutely no need to tell me how much I have neglected this blog this week because I already know. Today I don't have a product review for you (not enough time to do the video) instead I will begin a series that I wanted to start on this blog for quite some time now. I haven't officially named this series but I want to showcase people that I like to watch on youtube and blogs that I enjoy reading. There are other blogs and people on youtube who just tickle me PINK!!!!! Today I am in music mode so I will be sharing with you three singers that rock my musical boat. Priscilla Renea - recently signed a record deal but I have been rocking to her music on youtube for a while now. She writes, sings and plays instruments! I have seen her first music video and it seems as if her label is trying to throw her into a POP music box, my only hope is that she stays true to what made her a youtube sensation. Check out one of my favorite songs from Priscilla Renea "22". Another youtuber that just makes me chuckle is AlcoholHarmony. He has more than one channel on youtube but I will focus on the channel that features his rendition of the childhood classic- "The Itsy Bitsy Spider". If you can sing that simple song and make me smile- you've got TALENT. Hair butter, Hair Grease and I need to vent! I am so sorry for the delay but my job and other obligations have kept me away from my blog :-( Now let's get down to business- below I have a simple review of two Darcy's Botanicals products that I like to use, the Madagascar Vanilla Styling Cream and the Cherry kernal Palm butter product. Essencially the cherry kernal product is more like a grease while the vanilla cream is like a hair butter. Both can serve a purpose in your hair care routine depending on how you like your hair to feel. Both products are priced at $12.00 Check the review below. I only wish in the future she won't allow people to see how much they get to her, simply because some idiots will try to press her buttons intentionally. Side note- If anyone left a bad taste in my mouth that night it was Beyonce. Normally I like Beyonce but that night she just seemed like such a turncoat.... Everyone knows you didn't put Kanye up to that stunt so sit down and shut up no need to blast him by telling Taylor to have her "moment" a moment that Taylor didn't even thank Beyonce on camera for...I'm just saying. Hello Everyone -I hope you all had a splendid weekend. 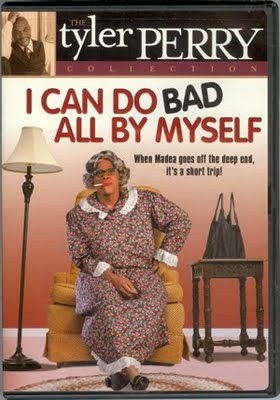 I Can Do Bad All By Myself" I was so pleased with the movie overall that I knew I would go back to the theaters on Sunday to see it again with my sis, and that is exactly what I did. Mr. Perry addressed a number of issues in this film, I don't want to get into all of them for those of you who have yet to see this film but he did a wonderful job. As I expected Taraji P. Henson, Adam Rodriguez and Brian White played their roles perfectly. The little kiddies played their parts so well too! Didn't Byron just break your heart? Sidenote #1- Did you catch Brian White's feet???? He clearly must have done too much stomping of the yard- but seriously he gets a pass since he used to be an Alvin Ailey Dancer. (click the Brian white link to check out the pics on his site including one of his dancer pics). It was great to see Brian play a different type of character. Sidenote #2 _Taraji really made me want to get that heair cut featured in the pic above, I'm loving it! It was a touching film that I could categorize as a "must see", so check it out if you haven't already done so. I want to personally thanks Mr. Perry for keeping Mary Blinky Blink Blige's (she blinks her eyes so hard and frequently) lines to a MINIMUM although I must say that her acting in this film didn't want to make me slap her with the business card of an acting coach. If you have not seen the film. you probably don't want to read the comments section, because I want to you tell me your favorite scene if you saw it this weekend. Product Review When I ran out of my Green Apple Antioxidant moisturizer by Juice beauty I decided to try out a new moisturizer. 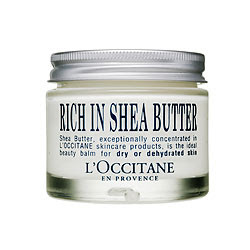 I ended up buying the "Ultra Rich Face Cream" by L'Occitane. This face cream is pretty thick, but it didn't clog my pores. It has a shea butter base and it includes soybean oil, rosemary and wheat seed extracts. However, it also includes 3 parabens which didn't make me a happy camper at all. This product claims that it will keep your skin moisturized for 24 hours. I didn't sit around keeping track of the hours, but I do know that I didn't have to reapply any moisturizer throughout the day. However, I never have to reapply moisturizer throughout the day even with other brands so that's not really saying too much. My skin doesnt look dry, it has a healthy glow when I wear this facial cream. You will pay $38.00 per jar. I know, I know you don't even need to say it, I am so LAME. Two days in a row with no real product review- forgive me. Now let's get down to business, you know what today is right? It's the opening of Tyler Perry's latest movie " I Can Do Bad All by Myself." As you may recall I was not the happiest camper after seeing his last film "Madea Goes to Jail", nevertheless, I will be in a theater tonight soaking in every minute of his latest flick. Will you be there????? Though I hope everyone does really well in the movie I can already say that I am not looking forward to watching Mary J. Blige in the film. I saw her once in a film named "Prison Song" (no need to kick me I've already kicked myself a million times for watching that) and her acting was HORRIBLE very much on the PDiddy level . Side note- I will never forgive Puffy for destroying Rasin in the Sun....that level of acting was just unacceptable. Anyway I hope Mary steps it up in this film- other than that everyone else will be great I'm sure. Do you have high expectation for this film? If you haven't heard, Mr. Perry has already started taping Why Did I get Married 2. I'm scared for him because the first one was wonderful in my opinion and I don't want him to hit a sour note, but knowing Tyler it will be awesome!!! He has the entire original cast and he promises that it will be better than the first!!!!!! Nene has really gotten on my last nerves this season. Am I alone in feeling this way? She seems louder, more annoying and her jealously is in high gear. Do you think Sheree really had an event to attend or was her late arrival a message to Lisa. Why didn't she want to take Dwight's advice? If outfits with unpressed seams came down the runway, that is a problem Lisa.........HELLLLLO. I thought her line was anything but HOT. Kim made a smart move by trying to include Derick in on her wig line. Was it me or did Kim somewhat confess to being almost broke now that she's not with Big Poppa? If she was working as a waitress and nurse when he met her and then he told her to stop working because he wanted to support her, since he's no longer in the picture--- What is her source of income? She said she wants to keep her kids up to the same standard of living but she needs a job...is she really just coming to terms with that fact???? lol Will she be the next housewife (not really a housewife but that's another story) looking for a new home? OHHHHHHH spoiler alert- Kandi has called off the engagement to her honey with 6 kid.......for now at least but only time will tell. Fashion week is upon us!!!!! Soon the beautiful summer weather will be a distant memory so I decided to embrace the upcoming fall season by incorporating some fun fall colors into my beauty arsenal. Various shades of green will make it's mark on the fashion scene this fall, but some makeup collections are ahead of the game. 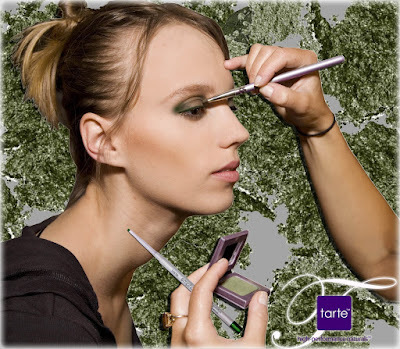 Tarte cosmetics, a company well known for its vitamin infused paraben free ingredients, has introduced some dazzling shades of green. EmphasEyes is a high definition creamy eye pencil designed with sensitive eyes in mind. The creamy formula can be attributed to the aloe leaf extracts and mineral pigments which many claim can soften skin. The eye pencil has been dermatologist tested so that it won't irritate your eyes like some of the traditional wooden eye pencils. This eye pencil is free of petro-chemicals, preservatives, phthalate, sulfates, gluten, mineral oil, propylene glycol, fragrance, and GMO. It's also a cruelty free product! Next up is a $17.00 eye color which comes in the signature Tarte lilac colored leather compact, which I just adore! The featured color is Peyton Place which is a shimmery khaki green. The color has some lovely gold undertones and it can play beautifully off of any skin tone. You can check my swatch below for darker toned skin and then look at the first picture in this post to see how it plays off of lighter tones. Both the eye pencil and eye shadow contain vitamin E! These products can be purchased from Tarte cosmetics or Sephora. Clean it, the natural way! 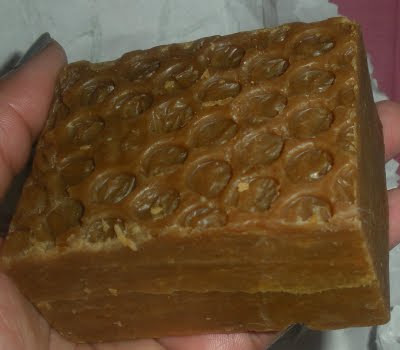 I started using the Oatmeal Honey Facial Soap from 100% Pure approximately 3-4 weeks ago and if you look at the picture below, you see that the size of the cleansing bar has not gone down too much. When I first received the product, it felt a bit soft so I expected it to last about a week or two at the most but it has exceeded my expectations. For an $8.00 price tag I am pleased with this cleansing soap. This cleansing bar really cleans my sensitive combination skin without drying it out. The real bits of oatmeal gently exfoliate my skin. The fact that this is a 100% natural, 100% vegan and gluten free product is an added bonus. I will continue to buy this soap in the future. However, this is not to say that I will abandon my other facial cleansers that received good reviews in the past! A gal needs a little variety in her life, right? Please check out the great ingredients list below. What are you washing your face with these days? Imagine my surprise when I walked into a Duane Reade store in Manhattan and I saw an entire section devoted to product by 100% Pure! I decided to pick up the Neapolitan scrub set. Remember the Neapolitan ice cream with the strawberry, vanilla and chocolate? Well the same concept is applied here, you have your vanilla bean scrub, chocolate mocha, and strawberry lemonade. 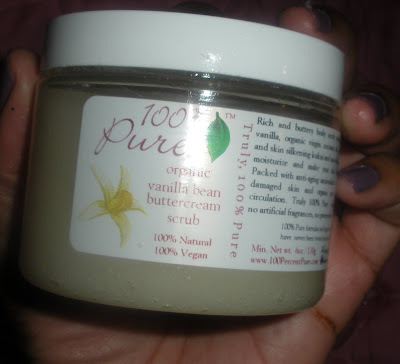 All three scrubs are 100% natural and 100% vegan so that totally rocks my boat. I must say that the chocolate mocha smells like COFFEE so I only use that one at night, not when I'm heading out and mingling with others. The scent of the vanilla bean is not too strong but that strawberry lemonade is right on point. Yummmy, it's a delicious natural treat for your body and it will only cost you $38.00 to take them all home. The strawberry one has that layer of oil on top and if that gets on your body, you won't need lotion. However the vanilla bean and chocolate mocha don't seem to that that same oily film, but it's still and effective scrub. The entire package comes wrapped in a pretty little ribbon too, so it's great if your giving it to someone as a gift. Today I present you with my all time top 4 deep conditioning hair treatments. 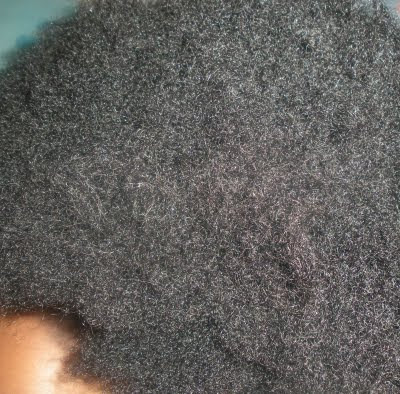 If you want to treat this as a tag please do, but let me know your top 4 deep conditioning hair treatments (especially if it's a homemade concoction). Hello Everyone and a big howdy doodie to my new blog followers! I am running very short on time these days :-( so my new post will appear tomorrow. This video shows a nice hand treatment that you can use..or make yourself! All these years and the singer Brandy had it right the whole time. In her song "Almost doesn't count" she shows that sometimes almost just isn't good enough, and the same is true in the makeup world. As you may recall I tried a mascara that was almost 100% natural, and it was a huge FAILURE in my book. So I decided to step it up and purchase a 100% natural, 100% vegan Fruit Pigmented mascara from 100% Pure. Since I was so disappointed with my last "natural" mascara I decided to purchase the $16.00 mini mascara in the color black tea instead of the full sized tube which costs $22.00. The mascara is available in three colors Blackberry, Blueberry and Black tea. **I will post the complete ingredients list at the end of this post, but each item made me squeal with delight-I LOVE natural products! This product does not clump and it certainly makes my lashes look longer. Unlike the last "natural" mascara that I tried this fruit pigmented mascara did not flake off on my face. A single application in the morning would last me throughout the entire day. This mascara will not give you dramatic lashes, if that's what you are looking for then use a primer first. However a primer will basically negate the purpose in using a natural mascara (unless it's a natural primer). I didn't get dramatic lashes, but I wasn't necessarily looking for that so I was beyond content. The mascara did give me that extra umph that I want for my lashes. It reminds me of a darker and all natural version of the stiletto mascara. I will certainly purchase this product again. A reader posted a comment on my youtube channel and she mentioned this mascara and how much she likes it, so I am not alone on this one..lol. Here is the ingredients list for the black tea mascara: Ingredients: Organic Green Tea, Vitamin E (a-tocopherol), Honey Beeswax, Contains All or some of the following Pigments: Blackberry, Blueberry, Black Tea, Grape Skin, Pomegranate, Acai Berry, Boysenberry, Blackcurrant and Raspberry, Oat Protein, Wheat Protein, Provitamin B5, Seaweed Powder, Coconut Stearic acid, Mica (for shimmer in the Blackberry and Blueberry), Cocoa Butter, Pearl Powder, Rice Powder, Cacao Powder and Powdered Coffee Beans, Lavender Honey, Extracts of Oregano, Thyme, Rosemary, Lavender and Goldenseal.